View by R. M. Batty, of the village of Amwell in Hertfordshire, south east England. 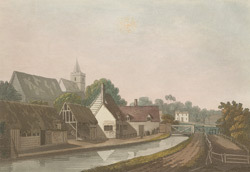 The buildings to the left of this print depict the glebe barn- where the local tithes would have been collected, and Thorpe’s farm (now known as the Keeper’s Cottage) on the banks of the New River. The parish church which is dedicated to St John the Baptist and which dates from the 11th century, can be seen rising behind these buildings.